5. 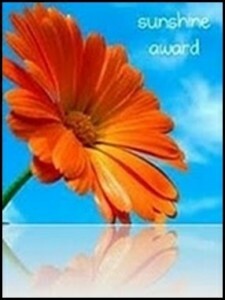 Share the love and link to the person from whom you received the award. The hardest part, of course, is narrowing it down!! Please go take a look at these to see where I get so much of my inspiration!! I do have a card today. 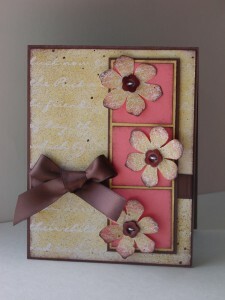 It is another card using the new Presto Patterns DSP from the upcoming Summer Mini. I am in love with this paper!!! 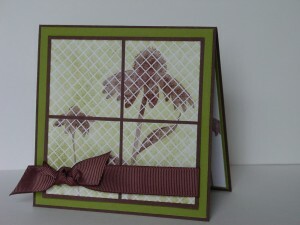 I used the window pane technique to make the card but the paper really did most of the work. I sponged Old Olive over this grid-style paper and then stamped the cone flowers from Inspired by Nature with Chocolate Chip. The ink comes right off of the “embossed” section of the DSP and you are left with this cool look. I cut the image apart, tied on some wide grosgrain ribbon and look at what I have!! Cool, huh??!! 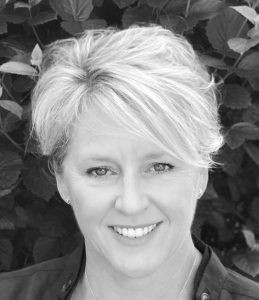 Thanks for stopping by and don’t forget to leave a comment…it really makes my day! Have a great weekend! 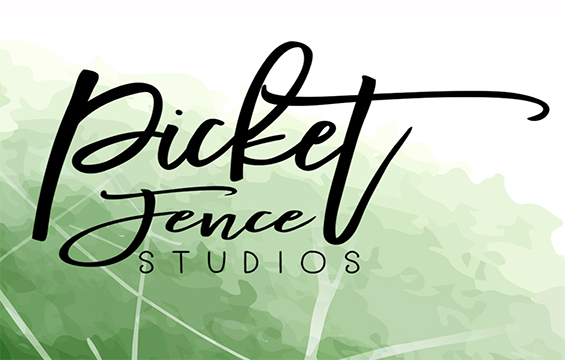 The wonderful team at Diva Coffee Break Designs chose me as their Featured Artist for this challenge. Thank you so much for the complement!! Happy weekend, everyone! I hope you are enjoying spring as much as I am. My boys are playing soccer and today is going to be a perfect day to be a soccer mom. Before I’m off to the excitement, I wanted to post this card I made yesterday. 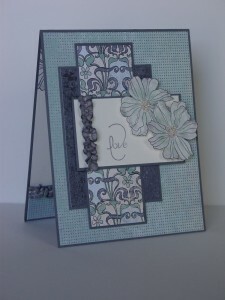 Margaret Moody over at Pals Paper Arts has come up with yet another fantastic layout. I knew this would be the perfect place to pull out my new Presto Patterns DSP and give you a sneak peek. This paper is white with embossed patterns. You get to customize it for whatever colors you want!! How much do you love that??!! The team over at Diva Coffee Break Designs came up with a beautiful color challenge this week and I wanted to give it a try. Cameo Coral is one of the retiring colors in this year’s Color Renovation so I’m working on using up my extra paper. I started with a base of the Presto Pattern DSP and sponged it with So Saffron. I then sponged the edges in Chocolate Chip and, as a final touch, sprayed on a bit of the Log Cabin Smooch Spritz (also new to the Summer Mini). I thought that Rock-n-Roll would be the perfect technique to use on the Vintage Vogue flowers. 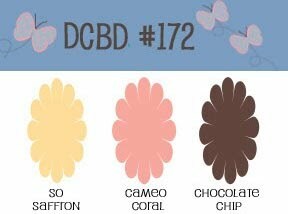 First I inked up the flower in So Saffron, then I did a “heavy” roll in the Cameo Coral and finally a “light” roll in the Chocolate Chip. I stamped all three flowers and Spritzed them, too. I cut them out and stitched on the buttons from Button Latte. After a bit more sponging on the flowers and the Cameo Coral squares, I put on the Chocolate Satin Ribbon. These colors are really pretty together and I love the effect of the Spritz. I can’t wait to hear what you think about the new products! Hope you have a great weekend! Have you ever had a card that was almost right? I mean, you like it but it just needs a little something. Well, that is how I felt about my last post. I really like the card but it was just missing that special something. I am teaching a Watercolor 101 class this week and really wanted to use this preview of the new set Elements of Style as an example. So, back to the drawing (or coloring) board I went. I reworked the colors and used Kraft (soon to become Crumb Cake) and Chocolate Chip. Really, who doesn’t like cake with chocolate chips, after all??!! I brightened up the colors a little bit to match the richer feel of the Chocolate Chip. As a final touch, after distressing and sponging the edges, I used my new Smooch Spritz that will be available in the new Summer Mini. This one is Log Cabin and has a bronze look to it. I thought the satin ribbon with the linen thread finished this card off right. 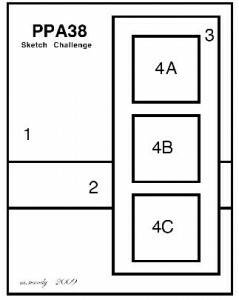 It is, of course, another take on the Our Creative Corner Sketch 10, except this time I stayed with the sketch orientation. Thanks for dropping by to see the new version! You comments are always appreciated. Well, if you haven’t heard by now, let me be the one to share the great news!! 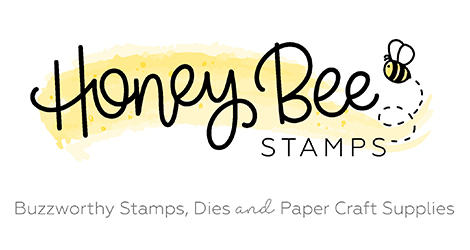 Stampin’ Up is having a Color Revolution and there is quite a shake-up going on. Some of my favorite old In Colors are returning, namely RIVER ROCK!!! Sorry to yell, but I am really, really, really happy about that! I have resisted using River Rock with my Soft Suede (even though they are amazing together) because I had to hoard my River Rock. Well, no more! I can use it with reckless abandon knowing I can get more. Yea! I just received my pre-order for the upcoming Summer Mini (be on the lookout, it starts on May 1st). The first set that simply had to be ordered was Elements of Style. I love it!! There were a couple of challenges that I wanted to try today and the first is the Pals Paper Arts challenge 37, Flowers. Well, Elements of Style is all about flowers so that was easy enough! Now to the layout. 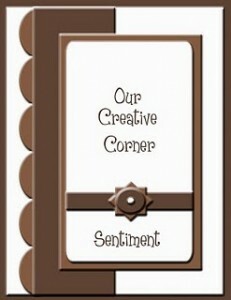 I headed on over to the Our Creative Corner Sketch blog for their OCCSC10. This seemed to have plenty of room for the big flower stamp! I (sadly) don’t have any River Rock ribbon left, so I just did a little piercing in place of the ribbon. I stamped the image with Soft Suede ink on Whisper White and colored in the flowers (using a blender pen) with So Saffron, Pretty in Pink, Rose Red, Night of Navy, and River Rock. These are all part of the core colors that are remaining. I distressed the paper and sponged with Soft Suede. 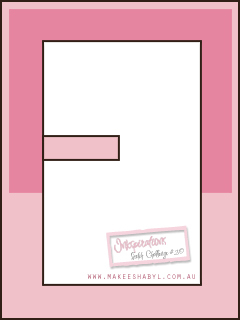 The small rectangle was created with the swirl and sponging with Soft Suede. I popped the image panel up on dimensionals then created a matching inside. I did find that flipping the layout worked better for me (it didn’t start that way though!). I hope you like this as much as I do. Thanks for stopping by! Happy Monday to you all! I hope you had a beautiful weekend. I know my family had a wonderful Easter…what a blessing! I actually have two cards for you today. The first is a birthday card for a 7 year old boy who is a friend of one of my sons. 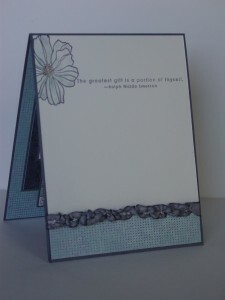 The second was a card for a swap that I did with Stampin’ Addicts. I received my swaps on Saturday, so I feel safe in finally posting my card. 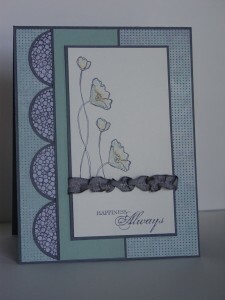 The first card uses a sketch from Stampin’ 411, their sketch challenge 145. 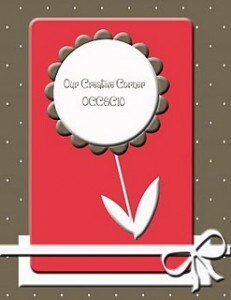 I also followed this week’s Our Creative Corner challenge to “Break out the buttons”. The sketch seems to lean towards using a button so this was an easy combination. I had some left over DSP from the Hand Drawn hostess bundle that has been retired. It is such a kid-friendly paper so I seem to always use it on cards where I need something quick and easy. This sketch is perfect for that Happy Birthday paper in the bundle! I used the lined paper to stamp the hat and words from Party Hearty. 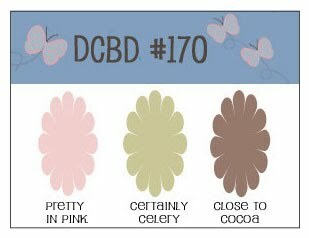 The celery ribbon is from the ribbon bundle in last year’s Sale-a-bration. Sometimes it is nice to use up some of those oldies but goodies!! The button is from the Sherbet button set. My card for the swap uses a variation of a sketch from Taylored Expressions. Her sketches are always wonderful. This swap was for thank you cards and the cards I got back are just super. 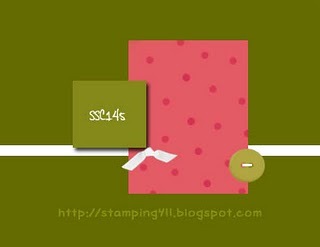 For swap cards (especially a demonstrator swap), I like to stick to one stamp set and one DSP. 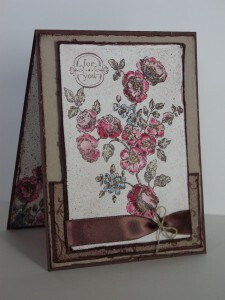 In this case, the stamp and the paper are all from the Lovely Flowers level 3 hostess bundle. I hope they are as happy with this card as I am with theirs!! Easter break has begun with the kids and the weather remains perfect in Northern VA. My garden is sprouting with spinach, peas and sugar snap peas! Yea, yea, and yea!! Hope you have a great day. Thanks so much for stopping by! That Oh, So Lovely Nouveau Chic! That Oh, So Lovely Nouveau Chic! 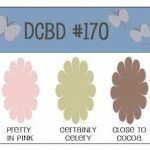 published on April 1, 2010 Read more posts by the author of That Oh, So Lovely Nouveau Chic!, JentimkoNo Comments on That Oh, So Lovely Nouveau Chic! I had so much fun with my last Nouveau Chic card, I wanted to make another one. This time, I used a sketch from Our Creative Corner chosen by the very talented Silke Ledlow. I love the big scallops in this layout! It is a glorious day here in Northern VA and I am off to play outside with the kids! Hope you are having spring weather too!! It's a Nouveau day! published on March 31, 2010 Read more posts by the author of It's a Nouveau day!, JentimkoNo Comments on It's a Nouveau day! Now back to the card… I used the sketch from Splitcoaststampers Sketch Challenge 274. This is another great one with loads of possibilities. I almost turned it on its side for a different look but the original sketch worked better for this particular card (maybe I’ll get another chance at it tomorrow!). 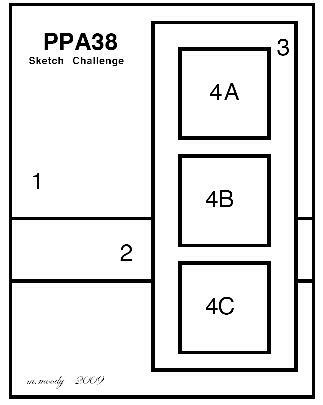 The Technique Lover’s Challenge 266 at Splitcoast this week is an Inside Out challenge. In other words, decorate the inside to coordinate with the outside. I am so happy I took the extra step inside!! I bet you are wondering about the ribbon, aren’t you??!! Well, it doesn’t take too long looking at my blog to realize that I am a ribbon addict, hoarder, collector! I love SU ribbon, I can’t stop with it! Why…because it is so easy to work with and the textures are so beautiful! Today I am working with the Basic Gray Taffeta ribbon. This one is easy!! Cut a piece about 50% longer than you need and make each end a straight cut (vs. on the angle). Unravel one end just a little until you can see the individual threads that go lengthwise through the ribbon. Find a middle thread and start to pull. The ribbon will start to smush together and you just work it down the piece until you have what you need. I attached the ends at the back with mini glue dots. On the piece inside the card, I used a couple extra glue dots to make sure such a long piece stays secure. I love the texture it provides for not very much actual effort! I used my watercolor blender pen with Sage Shadow and Going Gray ink to color the flowers, then used the fine tip end of an Apricot Appeal marker to color the centers. The “Love” word is from Well-Scripted (still available for another month). I inked it using a Going Gray marker being careful at the connection point between “love” and “you”. The fine tip of the marker fixed the tiny break in the script. Thank for dropping by today. I really appreciate your comments!! Off to work in the yard on a lovely day in VA!! Have a great day! I was quite a slacker last week when it comes to posting. Sorry about that! 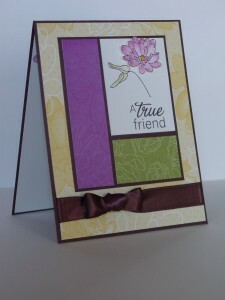 I was madly finishing cards for a Thank You card swap with Stampin’ Addicts. I’ll post that a little later so that I don’t release too much of a spoiler. In my last post I was ready to head out to the garden and that is what I did. My peas and sugar snap peas are planted, along with spinach and some early flowers. Can’t tell you how happy I am about that! Now I am prowling about the garden looking for little green sprouts (that aren’t weeds…ugh!). Such fun! My boys helped me plant some Italian parsley and basil inside so, of course, they are on sprout patrol too. I love this time of year! 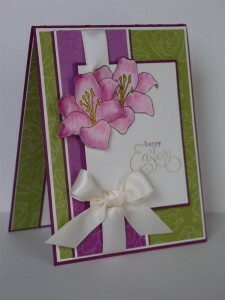 My garden lilies are starting to show signs of life and they were part of the inspiration for this card. I used the Pals Paper Arts sketch challenge for the week and turned it. I also wanted to do another Easter card for the Our Creative Corner challenge to create an Easter/spring card. I have been really using this Lovely Flowers (hostess) paper a lot lately. The Rich Razzleberry really is a great Easter purple!! 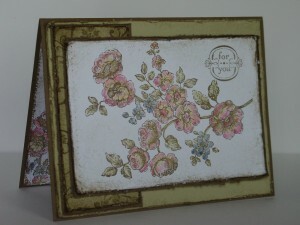 This uses the Fifth Avenue Floral set which will be 20% off in April as part of the Two-Step into Spring promotion. I watercolored these lilies with Rich Razzleberry, Melon Mambo and Crushed Curry on the watercolor paper. Don’t forget that you can see the picture larger by clicking on it. Thanks so much for dropping by!! The rain has ended and the plants are showing signs of spring! I’m ready to start planting the early seeds in my vegetable garden tomorrow! Can’t tell you how happy those things make me!! I have a hostess club meeting next week and I am absolutely sure they are feeling just like me so I needed to make a spring card. Of course, the puffy flower is all the rage these days so what better to use?? I just got this Tea Party DSP and I can see that I’ll be using it up fast. Such pretty colors! I know I have professed my adoration of ribbon before, but this SU satin ribbon is really fantastic. I just got the Celery (HAD to, it goes so well with the Tea Party paper…LOL). 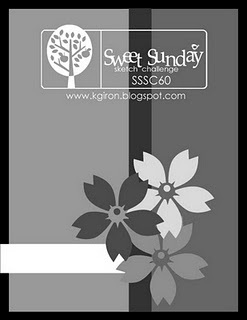 When I saw the Sweet Sunday Sketch Challenge for this week, it was perfect for what I needed. I love that it is a basic layout where you can really emphasize one focal point! I cut the DSP in half and used both sides of the same sheet. They were sponged with Certainly Celery ink to mimic the sponged look of the DSP. I punched five layers out of various papers from the pack to give some character to the flower. This flower is a little less puffy than some but I like that you can see the button! After I crinkled the paper for the flower, I sponges those edges too. The little “tag” is a slight change on the sketch but it worked better for me. These little flowers really are fun. I have another card with a full flower so the club can see both. It is still cloudy here so the colors seem a little washed out on the card. The sun is coming soon though and I’ll be out digging in the garden! Have a great week!! Thanks for stopping by!